Before starting her career, Louise had singing lessons at the Queensland Conservatorium of Music, where she learnt opera. This gave her a good grounding to be able to sing all genres of music, which, for more than 30 years, has been warmly welcomed by music appreciating audiences all over Queensland and overseas. Louise Winton Sings now brings the experience to you, at a time and place to suit, through House Concerts and Fundraising Concerts. 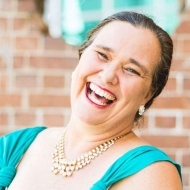 Louise followed her passion for musical theatre and embraced countless lead roles in most of the well known musicals, presented by theatres all over Brisbane and Townsville. When the spotlight wasn’t shining upon her as an actress, the lady known for her bubbly personality and infectious laugh, compered many a karaoke event, allowing others to explore their ‘talent’. While living in North Queensland, Louise was booked weekly to perform at Latitude 19 Resort, Magnetic Island. She was also the guest artist for fundraisers held by the Variety Club. Louise was a popular, regular performer at The Opera House in Jersey in the Channel Islands and attracted many followers in the UK. In the late 90s, when the late night performance scene became an obstacle in raising her family, Louise created a daytime business opportunity. The creation of HoneyBun, the brightly dressed children’s edu-trainer, with blue hair, captivated and changed the lives of hundreds of thousands of children for approximately 15 years. Louise wrote the scripts and songs for 13 educational shows that she performed in the early childhood sector all over Queensland. Louise, as HoneyBun, gained enormous respect from organisations such as ACT for kids, RSL QLD, Australian Dental Association, Queensland Ambulance, just to mention a few. Sharing her passion for acting and performing, Louise also developed a low cost drama school designed for primary school aged children to be able to write and perform their own productions in front of their own family and friends. Many of her students became school leaders and have furthered their skills in acting, singing and performance.